As I mentioned in my last post, I’ve been having fun playing with “cream” made from roasted onions. 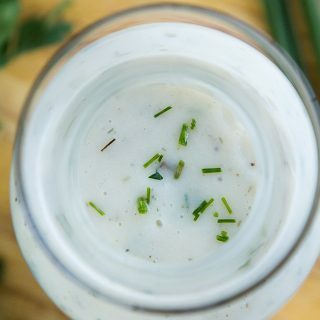 I promised you recipes, and since a truly fat-free but delicious ranch dressing can be so hard to find, I thought I’d start with my new onion-based version of that classic (but usually decadent) dressing and dip. It doesn’t have the over-the-top richness of dairy ranch, but I think you’ll find that it’s tangy and flavorful and just creamy enough. 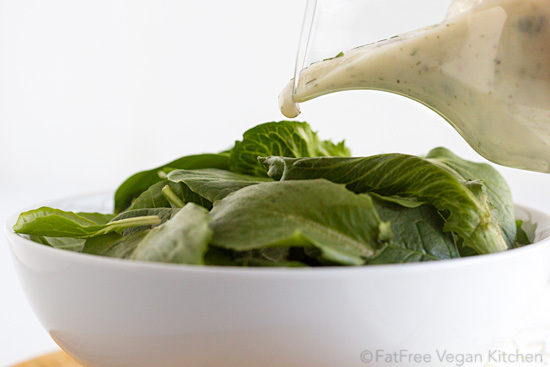 I love this fat-free ranch dressing on salads, of course, but it also makes a great dipping sauce. My current favorite vegetable to dip is simple roasted asparagus, which is finally in season and doesn’t require a second mortgage to buy. If you missed it, be sure to check out Fat-Free Onion Cream and watch my first full recipe video. More recipes using it are in the works! 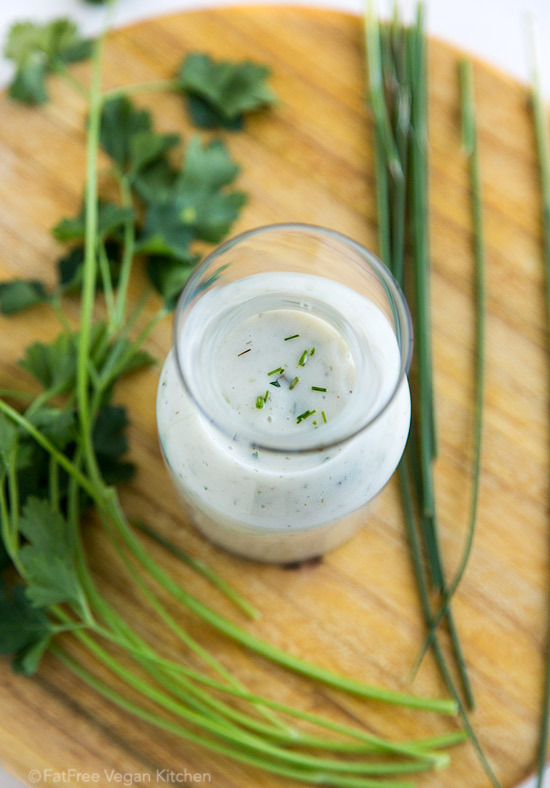 Most ranch dressings get their addictive properties by using a combination of buttermilk, mayonnaise, and sour cream. Some even contain cream cheese! Because this version doesn't contain any of those high-fat ingredients, it will taste less rich to those who are used to fatty dressings. If you want to increase the richness component, you can add a handful of raw cashews to the blender and increase the seasonings to compensate. Make a batch of Onion Cream following the instructions here. Measure out 1/2 cup and return it to the blender. Reserve the rest in the refrigerator or freezer. Add the non-dairy milk, vinegar, and garlic to the blender and blend until smooth. Check the thickness. The vinegar should have thickened the milk, but if you're not using soy, it may be a little thin so add 1/4 teaspoon of chia seeds and blend until smooth. Pour into a bowl and whisk in the remaining ingredients. Add salt to taste. Refrigerate for at least one hour. The flavor will intensify over time, so only add additional herbs and seasonings after it's had a chance to "rest." Serve as a salad dressing or a dipping sauce for vegetables. I like dressings to be tangy, so I use 2 tablespoons of vinegar in this recipe. Feel free to start with 1 tablespoon and add more to taste. This dressing uses a half cup of Fat-Free Onion Cream, which is about half of that recipe. So if you like, you can just make a half-recipe (two onions) of Onion Cream. Looks wonderful Susan! Very creamy looking, and I bet it’s delicious! Thank you! Thanks Susan — this sounds wonderful! Made a creamy Italian today with the onion cream but only had dried herbs. (my DD is borrowing my car…) It is good though- the cream lends wonderful depth! This looks great and will try it next time. I’m certainly going to make the onion cream and the ranch dressing but I wonder why some.of.the herbs are fresh, but the dill.is dried. I always find it frustrating to have to spend $2-3 for a tsp or tbln of herbs, and often the remainder goes bad. I often freeze some but wonder if those are as good as fresh when the next recipe calls for fresh. Some are good for my homemade broth and like parsley are good tossed in a salad, but not always. I hate to waste! Any hints? I used dried dill because that’s all I had. (I grow parsley and have chives growing as a weed in my yard, so I usually have those fresh.) Whenever a recipe calls for dried herbs, you can use fresh just by doubling the amount. If you freeze dried herbs, they will last longer, but they won’t be the same as fresh. An intriguing recipe which I will definitely try. A small point — buttermilk, at least in France where I live, is not a high-fat product. It is made from skim milk and is called lait ribot or lait fermenté. Of course, it’s not really buttermilk either, it’s a substitute product developed by the dairy industry, using skim milk and a lacto-bacillic culture. It’s basically drinking yoghurt. U can EASILY make butter milk by curdling vegan milk. So usually that means 1c of say, soy or almond milk with 1t of applecider vinegar or lemon. Et voila…. best vegan pancakes made with that………..
Any idea how long this would keep in the fridge? It looks incredible. I’d guess it’ll last about a week, maybe a little longer. Thanks for your generous web site. It has helped me with my fat free vegan diet after reading the China Study and Dr. Esselstyne. I am healthier as a result and also allergy free – celiac runs in my family family but I think my great grandchildren will be free of it as they only have one parent with it. This recipe will stand by my Cauliflower Puree from Chef Del’s Better Than Vegan which also adds creaminess and also tastes good.Thank you, once again. I have a lot go vegan friends and am transitioning there myself. I designed this fun teeshirt in celebration of the new life step! I used the cream as a base for broccoli slaw. I added 2 T apple cider vinegar, a dash of vegan Worcestershire sauce, 2 t siracha, and some fresh ground pepper. Tossed the package of broccoli slaw(broccoli stem shreds, carrots and red cabbage) with dried cranberries and 1/2 of the recipe of onion cream. My hubby loves it! So do I! I made this last night. It was fantastic. I have always wanted to learn how to make my own dressings. This is a very simple almost no fail recipe. Thank you and please keep up the great work. I love your blog and look forward to reading it daily. I just discovered your website today. I am 76 years old and have been a vegan for three years. Your recipes sound so WONDERFUL! I look forward to making my vegan lifestyle even tastier!! My cardiologist is thrilled with my new eating habits. I have had 2 heart attacks and a stroke between the age of 40 and 55. Finally came to my senses. I have lost almost 30 pounds and just recently had the best ever results of blood tests. Cholesterol down 80 points, blood pressure down 30 points and full of energy. Thank you for doing so much for so many. This just looks delicious. I bet it would taste good on an oven-baked potatoes with crispy skin. I like the addition of cashews as a means to make it creamier. I just discovered your site and am beyond excited to start trying your recipes! I’m not 100% vegan but am on an extremely low fat diet due to gallstones. With this recipe could I use skim dairy milk in place of the soy milk? You can, but like the soy milk, it would probably work better if you add something to thicken it. If flax is out because of the fat, you could try whisking a little flour into the milk. Eating raw flour isn’t that great, I would recommend an arrowroot or agar agar powder for thickening. Thank you for the recipe! I roasted some onions and made your ‘Ranch’ style dressing and it is wonderful! I added fresh dill from the garden and a bit more fresh garlic. We’ve eaten it on two salads and it’s a keeper. I also thought is could make a great base for Greek skordalia sauce…..used as a dip. I’m going to try that next! Thanks again for your efforts. I made this and it didnt taste good at all. It was really really sweet and tangy and sour. I used yellow onions for the cream and subbed 1 tablespoon apple cider vinegar for the white wine. I also used almond milk for the milk and fresh dill instead of dried, so the color of mine if green instead of your white. The onion cream was very sweet, even though I cut it with a generous amount of lemon. Any suggestions what I did wrong.? Thanks so much! You’re a lifesaver. Apple cider vinegar is more acidic than white wine vinegar, so that could have made it too tangy and sour. Almond milk also has a stronger flavor than soy milk, in my opinion, and I never use it in recipes because I can always taste it. Also, when using fresh herbs you need to use more than dried, about 3 times more. Whenever you make a lot of substitutions to the author’s original recipe, you have to realize it may not come out as good because they’ve used those specific ingredients for a reason. Best way to test it out is retry it using the exact ingredients listed. Good luck! It really depends on how sweet your onions are. White onions may be less sweet than yellow. Absolutely delicious dressing, changed my salad’s taste completely. So great, thank you, Susan. This is fabulous! I roasted some garlic cloves and added a couple of those instead of using raw garlic. Appetising dressing, Susan! My salads will be more delicious with this dressing. Susan – all the soy milk I find does contain fat. Why do you say this is fat free? I think it’s a great recipe, and the onion cream is brilliant, but it’s just confusing to me. Dan, on this site, fat-free means free of added oil, not free of the fat that is naturally in foods. All foods have some fat, so there’s no real fat-free food (except water), and though we try to limit higher-fat foods such as nuts and avocados and soy, they’re still allowed in limited quantities. How many tbsp is a serving? Thanks. About 2 tablespoons per serving. Thank you, Susan, for all your creative work and willingness to share. You work hard so we can be healthier. I am 71 and have been inching up on being a full on ‘Whole Fodd, Plant Based, Low SOS type vegan ever since I watched Forks Over Knives 4 years ago and began following Esselstyn, Campbell, McDougall, Goldhamer and nutritionfacts.org by Gregor. I’m impressed with your out-reach to help the world understand and implement these healthy ideas. Thanks so much for the kind words, and good for you for going plant-based!